The fresh scent of spring, the smell of bread baking in the oven, the smell of the forest during an autumn walk – the odours we smell influence our moods, evoke memories of childhood or of specific places. But what are odours? Can we describe them in any manner other than descriptive, using words like “fresh”, “musty”, “light”, “heavy”? That is difficult. Odour is best described as what our brains perceive through our noses. So it is very individual, since noses and brains differ between people. What may smell nice to one person may smell really bad to another. Personally, I hate the odour of cigarettes, but there are many people that like the odour. And it is even harder to imagine what something smells like to another animal like a dog, because dogs have many types of receptors we don’t, and they are more sensitive to many odours than we are. In training dogs to detect a particular odour, we are therefore severely handicapped: we cannot use our own nose to determine what a dog could, or could not, smell. Understanding a little more about how things smell can help us. Even though we are smellhandicapped, by understanding some elementary physical characteristics of odours we can at least try to get a handle on what we are asking our companions to do. The basic thing to remember is that what enters our noses and stimulates the smell receptors are volatile molecules or odorants. When we are training a dog to detect any kind of material, the dog doesn’t really smell this material itself, but smells the odorants that come off from it. And almost all materials emit odorants to some degree. It depends on the particular characteristics of the material we want our dogs to find and on environmental circumstances which odorants arise, and how many of them come off. Think of a glass of water. There is water in the glass, and there is water in the air – humidity. Molecules on the surface of the water rise into the air, others are deposited back into the glass – depending for example on temperature. An animal hunting for water does not respond to the water in the glass – it responds to the water molecules in the air, and by detecting concentration differences, it gradually locates the source – the glass. Now imagine that you add a few drops of acetone to this glass of water. Acetone, as a material, has quite different characteristics than water. For one, it is much more volatile – the molecules evaporate into the air much more easily. The few drops of acetone in the water may be negligible as far as their concentration in the glass – but the air above the glass, the “headspace”, will be dominated by the acetone molecules. This basic rule holds for all materials made of different chemical components. Components differ in their volatility, so they will evaporate into the air differently. This means that the chemical composition of a material can be quite different from the composition of the odorants in the headspace! For example, if a material consists of an equal mix of 3 components that differ in volatility, the resulting composition in the headspace will be quite different. If one component is much more volatile it will dominate, and the other two components might only be present in small amounts. Basically, this means that the composition of the material as is described “on the box” does not necessarily mean that the odorants of that material are the same. Even 99,8% pure TNT, an explosive all bomb dogs are trained on, is only 65% TNT in the air – the remaining 35% of the odorants come from the much more volatile 0,2% components in the product. And usually dogs don’t search for very pure stuff. They look for landmines that have TNT in them. But these mines also contain plastic, metal or wood, there may be rubber closure rings, and they contain a small amount of a more sensitive explosive to set it off. Or dogs search for drugs – cocaine itself is not very volatile, but an associated breakdown product is. Smart handlers are aware of this, and realize that they need to understand what things smell like to optimize their training. Another issue is that different producers may be making similar products, but that differences in the way they do this have an effect on the odorants. Differences in the base materials, or in the production process, or accidental contamination can lead to profound differences between batches of what SHOULD be the same stuff. In the production of consumables such as coffee a big effort is made to guarantee the typical taste and odour using panels of people to compare new batches to a standard. But who cares for odour consistency in the production of explosives or drugs? 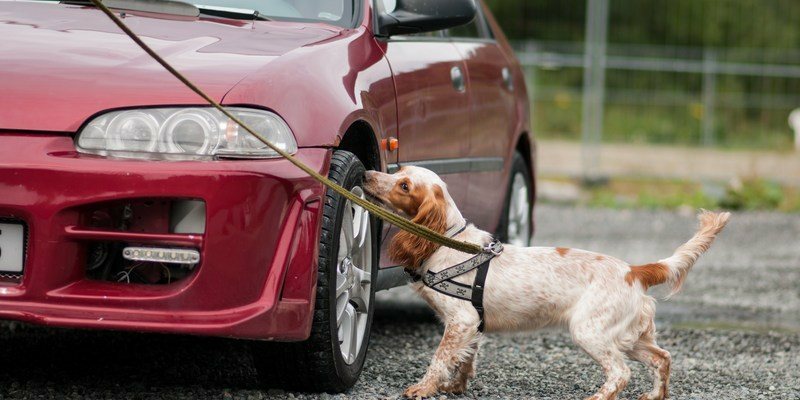 What does this mean for training dogs to find things? It has a huge impact. If you only have one kind of explosive containing TNT to train on, your dog will learn the characteristic odorants of that particular explosive – and may not recognize the same kind produced by another company. Which makes the dog unreliable. If you train your dog on weed from Afghanistan it may not find weed from Morocco that really has a different set of odorants. But there are more issues. I remember a dog who was rewarded during agility by a tennis ball that was thrown as a reward after he’d completed a task. He loved this, he would race right after the ball and retrieve it. Until one day, the handler was slow, and the trainer threw her own ball instead. The dog raced after it, but arriving at the ball, sniffed it, and turned around to his handler with an expression that was incredibly amusing. The dog completely refused the trainer’s ball – to us, an ordinary yellow tennis ball, but this dog smelled it was not HIS ball. Lesson learned? Two tennis balls do not smell identical. Contaminants from the outside – the scent of the handler, the scent of dog himself – made his own ball smell completely different. So in training, what’s available in the air of what you’re training on is important. And differences between batches of the same stuff are important. And contaminants from the outside are important too: the handlers odour (that is why people wear gloves or use tongs), but also other typical odours such as odours from the storage location or from the car used to transport the training material. A lot to think of when training a detection dog, who should locate stuff he’s never found before…..! Oxley, J. C., and L. P. Waggoner. "Detection of explosives by dogs." Aspects of Explosives Detection. Amsterdam, The Netherlands: Elsevier (2009): 27-38. Lorenzo, Norma, et al. "Laboratory and field experiments used to identify Canis lupus var. familiaris active odor signature chemicals from drugs, explosives, and humans." Analytical and Bioanalytical Chemistry 376.8 (2003): 1212-1224. Below symbolizes the material composition of an object:50% component blue, and ca. 17% each of components red, yellow and green. Green is relatively very volatile, and blue is relatively nonvolatile. On top, the resulting air composition is symbolized: almost 80% component green, 8% components red and yellow, and 5% blue.